Now, I am aware that this is super non-traditional black forest cake, but I love dense chocolate cake! Fresh cherries also make this extra rich so all you need is a small piece. This cake serves at 10-12 people easily. 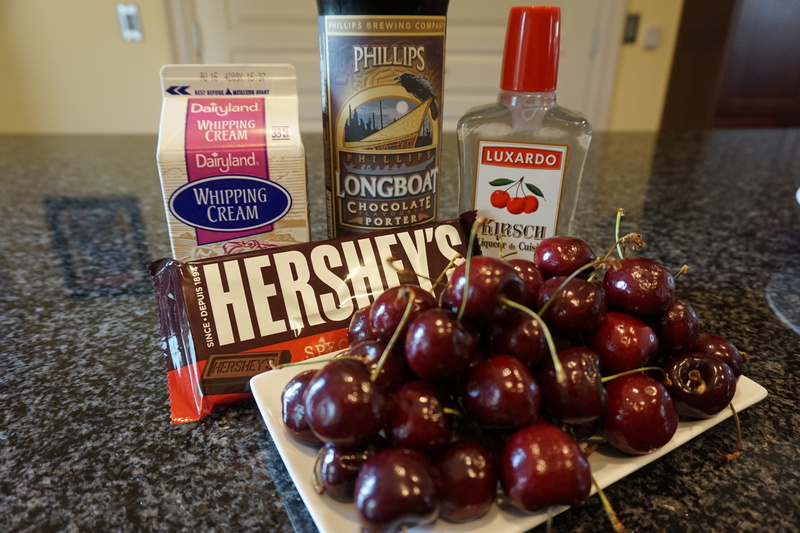 Phillips Longboat Chocolate Porter is one of my favorite beers, I always have one in the fridge, even in the summer, so I have been itching to cook a dessert with it. Fun fact, the label has E.T. riding in a boat on it, so you can play a little “where’s waldo” with that! 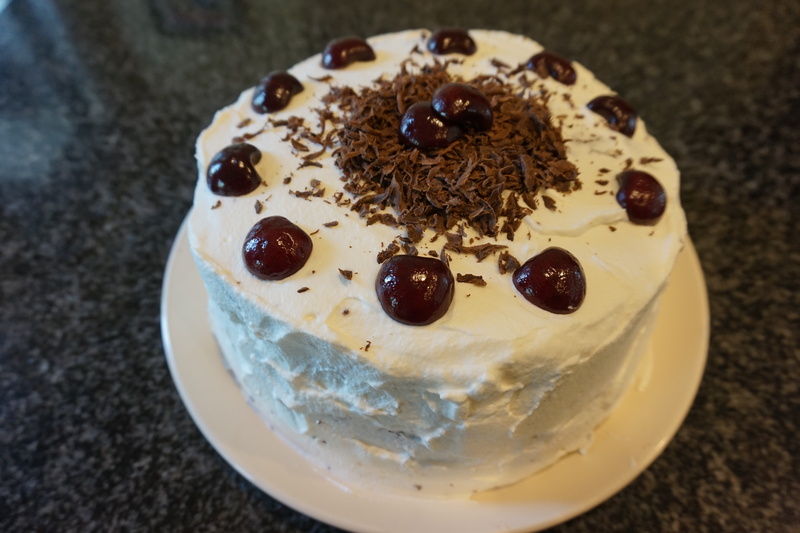 For simplicity, I have listed the three elements of the cake’s ingredients and processes separately, but you can get the cream and cherries going while the cakes cook, the order doesn’t really matter. Don’t forget to also buy some chocolate to top the cake with! 1. 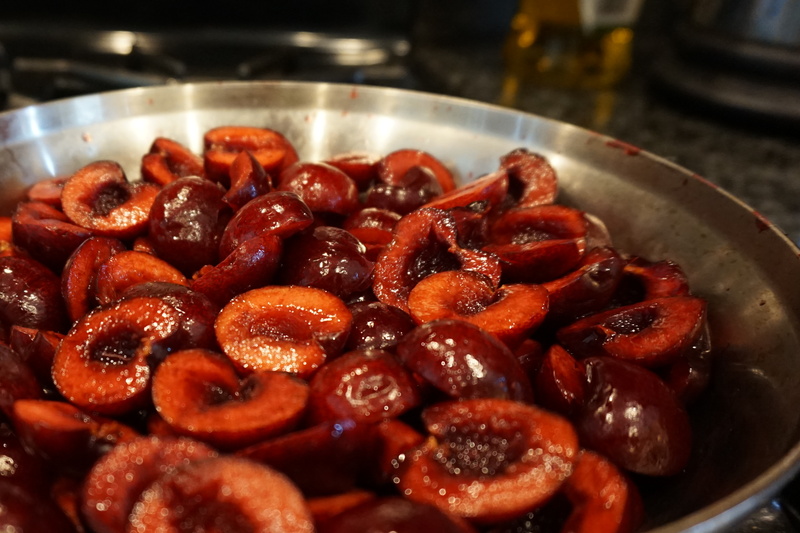 Prepare the cherries by removing the stems and pitting them. 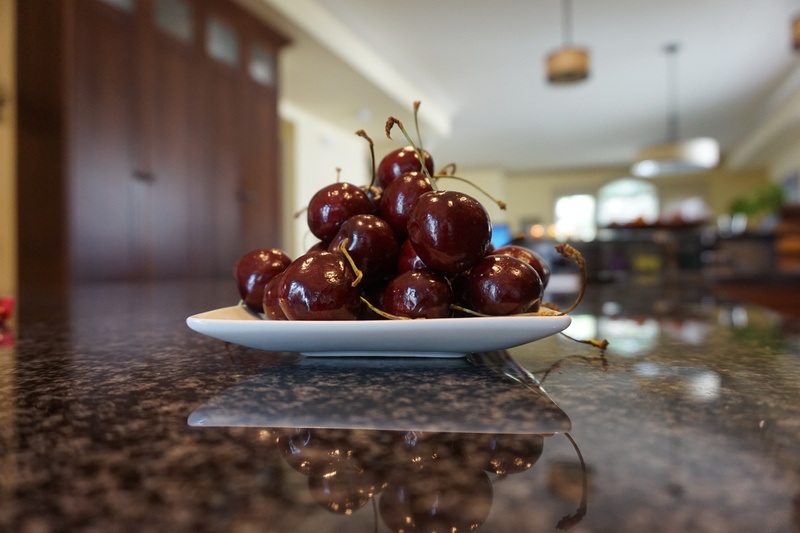 To pit easily; run a paring knife around each cherry from stem to stem and twist to remove one side, then pop the pit out of the other side. 3. 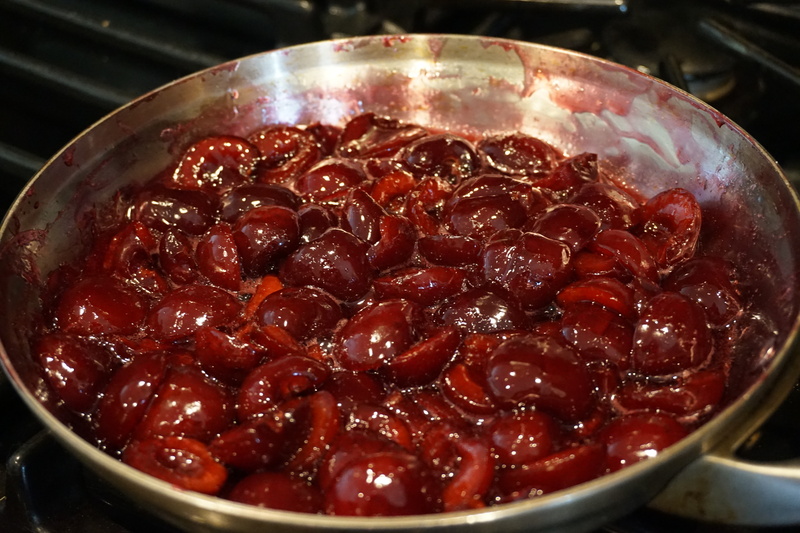 Place remaining cherries in a small skillet, add kirsch and sugar and simmer on low heat for 15 minutes. 4. Mix in the corn starch water and stir while cooking a further two minutes. 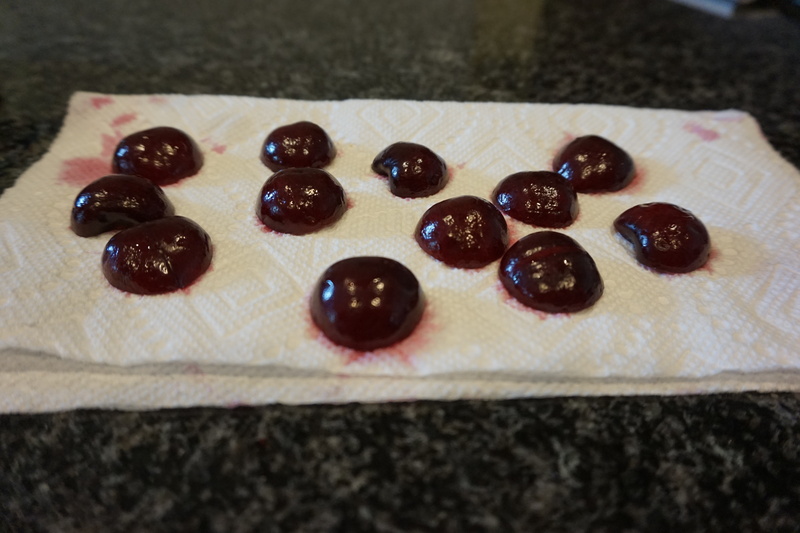 The cherries should still hold together, but be soft and glossy. Set aside to cool. Whip the cream until it forms stiff peaks, adding the vanilla and icing sugar just before it is done. Set aside. *Cake recipe modified from epicurious.com Chocolate Stout Cake, I cut down the sugar and cocoa powder so that you get more rich flavour from the porter. 2. Butter and flour two eight-inch pans, set aside. 3. 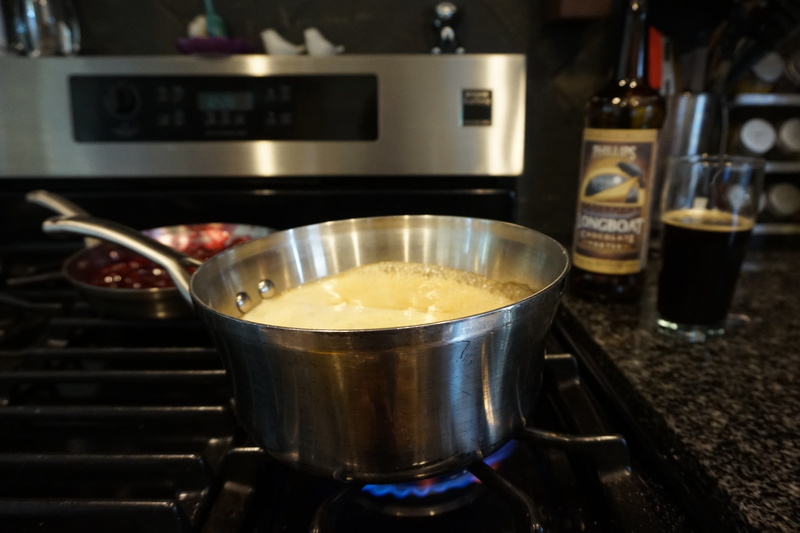 Bring the porter and butter to a simmer in a medium saucepan. Once the butter is melted, set aside to cool for minimum five minutes. The bonus with using a bomber for this is there’s just enough left over to have a small glass of beer to be enjoyed while you finish cooking! 4. Sift flour and cocoa into a mixing bowl and then add the baking soda and salt. Stir to combine. 5. In another bowl, whisk together eggs and sour cream, then gradually add sugar until well combined. 7. 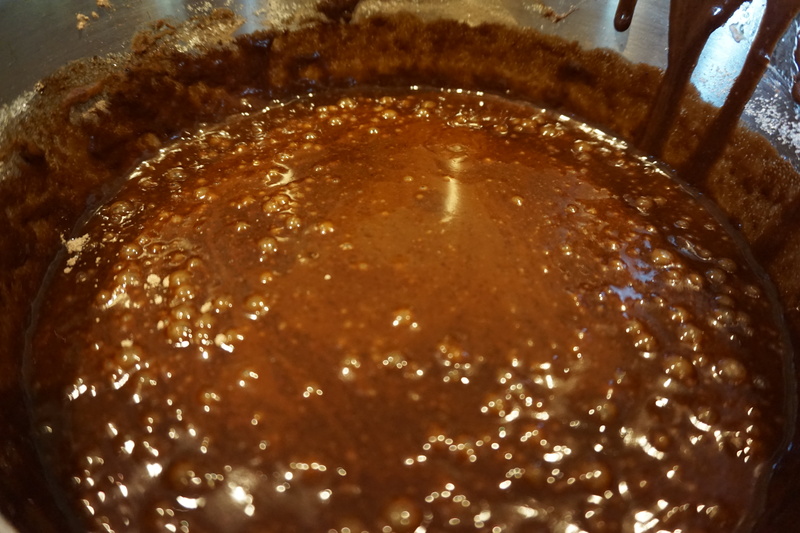 Now fold the dry ingredient mixture into the liquid with a spatula, one cup at a time. 8. Divide the batter between your two pans and bake in preheated oven for 45 minutes to an hour (depending on your oven). 9. Let cool for 15 minutes before transferring to wire racks then let cool a further 10-15 minutes. 10. Using a serrated knife or a cake cutter, level each cake and then cut each in half, if the cakes are not entirely cooled at this point, let them sit longer. It is very important that the cakes are nice and level or they will not stack well…and you do not want the leaning tower of cake! 12. 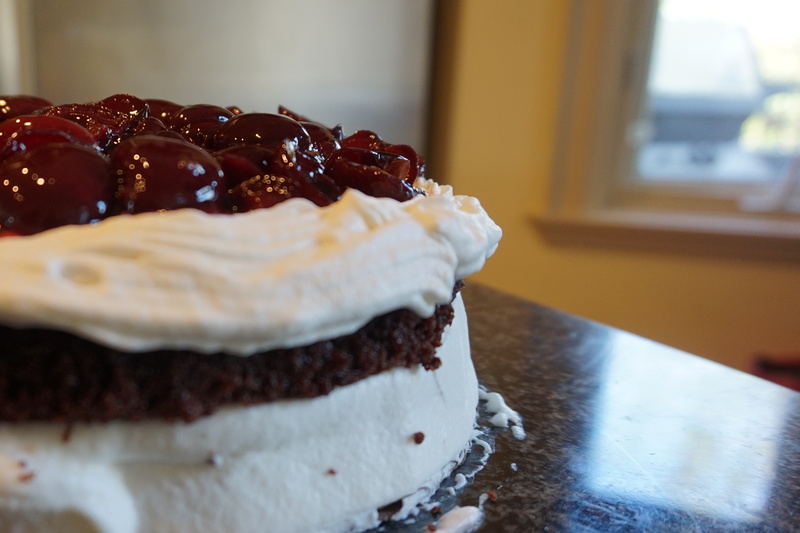 To assemble, set down the first cake, cover with a thin layer of cream over the top and edges, then place the second layer on top.For the middle layer, form a ring of whipping cream around the edge and then fill with the cherry mixture. Place the third layer on next, add another thin whipping cream layer and then top with the final layer. 13. Using a long spatula cover the cake with whipped cream and smooth all over. Top with the extra cherries and shaved chocolate. 14. Invite friends over to consume this bad-boy cause trust me, its a big one! Previous Itsy bitsy teeny weenie little bridal shower treaties! Next Shortbreads two ways – because Grandmas know best!